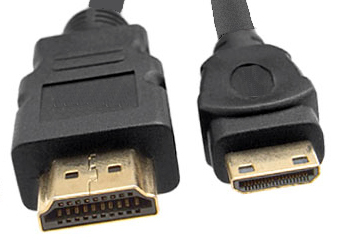 The 1440p HDMI Type C Mini cables use the new smaller HDMI connector that offer enhanced audio and video performance in a mini connector for SONY Handicam, Canon, JVC and other camcorders, future PS3's and other small devices. The mini male HDMI to standard male HDMI cable is capable of supporting resolutions up to 1440p or most common 1080p ( 1920 x 1200 ). The mini HDMI cables are certified for HDMI 1.3a compatibility and therefore are compatible to all possible video resolutions and digital audio standards that are available via HDMI type C connection. The HDMI mini type C 1.3a to HDMI Standard cables are compatible with Sony VMC-30MHD, HDR-SR5C, HDR-CX7, HDR-SR7, VMC-15MHD, Canon, and JVC, etc. camcorders that have the small Type C mini female connector. They also work with any other camcorder, or device, that has the same small Type C mini connector. There are 2 HDMI connectors, Type A, the standard up to now and this new smaller HDMI Type C. Both Type A and Type C consists of a 19 pin connector and 19 wires. Lipsync: They coordinate the output of audio and video which is important as all many types of video and audio equipment can cause unequal delay in the signal. Double the Data Rate: Upgraded from 4.95 gigabits per second to 10.2 Gbps. Deep color: The new spec HDMI 1.3a allows for billions of colors instead of millions. Uncompressed audio: Dolby TrueHD and DTS-HD Master Audio can be sent uncompressed. Cablek's HDMI cable will not only support the fast 1080p signal but of course will support today's resolutions of 480i, 480p, 720p and 1080i and even the future 1440p. These cables are HDCP compliant assuring you of seeing a copy protected picture. These HDMI Type C connectors are much smaller than HDMI Type A, but carry absolutely the same audio / video specs as HDMI Type A. Your new HDTV camcorder, or any other portable device that has this smaller HDMI connector, can now be connected to you HDMI equipped HDTV with our type A to type C cable. This new HDMI Type C connector is for portable devices such as SONY Handicam camcorders and like Type A has 19 pins. The 19 pins facilitate the three high speed TMDS channels, the TMDS clock channel, DDC channel, CEC Channel, a +5v and hot plug detect features. It is important to note that HDMI is backward compatible with the single-link Digital Visual Interface or DVI-D (technically HDMI Type A is backward-compatible with DVI-D, HDMI Type B is backward compatible with dual-link DVI).